For the second consecutive year, U.S. March tornado counts are among the lowest on record. A preliminary 21 tornadoes touched down across the nation in March. The lowest March U.S. tornado count on record dating to 1950 was six tornadoes in March 1951, according to The Weather Channel's severe weather expert Dr. Greg Forbes. 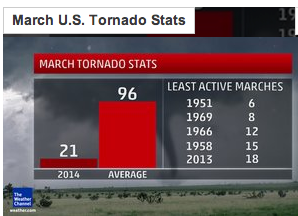 If this sounds familiar, March 2013 was the least tornadic March in 35 years, with only 18 tornadoes. So the last 2 years have been near record light tornado season. What is your prediction for the remainder of the 2014 tornado season? March continues a slumbering tornado trend for the year. A preliminary 66 tornadoes have been tallied in 2014 as of April 1; this is just over one-third of the 10-year average-to-date of 186 tornadoes. 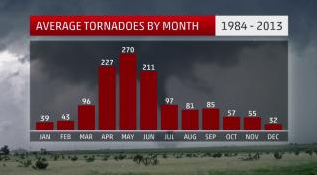 "Twenty other years since 1950 had fewer tornadoes (than 2014) through March 20," says Forbes. "There had been just eight tornadoes thus far in 1969. The 41 tornadoes in February 2014 have kept the year from being closer to a record-low pace." 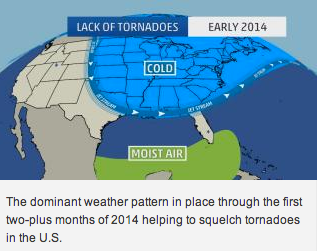 The image shows the dominant weather pattern in place through the first two-plus months of 2014 helping to squelch tornadoes in the U.S. Essentially the same pattern responsible for a persistently cold and snowy winter in parts of the U.S. also, for the most part, squashed the threat of severe weather through the first three weeks of March. As you can see in the bar graph above, on average, the U.S. witnesses a marked ramp-up of tornadoes in April as warmer, more humid air flows farther north to intercept under the still-energetic polar jet stream. A corridor from the southern Plains to the Tennessee Valley is typically in the highest risk for severe thunderstorms in early April, however, those are just climatological averages. Early April severe weather can stretch into the Upper Midwest, Ohio Valley and even parts of the East. Insurance General Contractors - "Tarping roofs at a disaster near you."